Repro Marshall style metal handle, fits '71 and later Marshall cabs with plastic handle bolt pattern & cab cutout. Original Marshall metal handle is on the left, Scumback Speakers reproduction on the right. As you can see the finish is spot on, and the six bolt holes are there, along with the chrome handle. Handle size is 11" long x 6 1/4" wide x 2 3/4" deep. 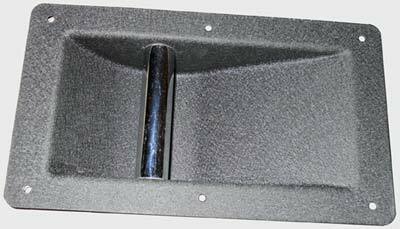 The new metal handles are sized for a direct fit into cabs from 1971 to present using the plastic Marshall handle. The bolt holes are the exact same size and spacing. You can easily take off your busted plastic handles and bolt these into the same place using machine screws and T-nuts, wood screws or rivets. 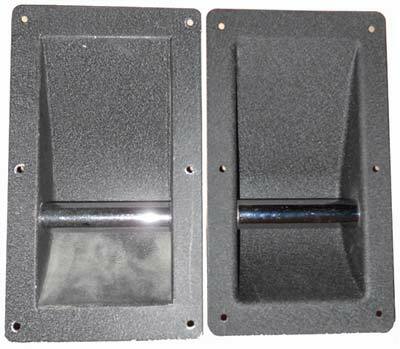 You could also retrofit your Handwired Marshall, Orange, or Sound City cabs for the proper look with the thicker metal, and knowing you can't bust the corners on these. All you'll need to do is drill out your existing handle's rivets with a 1/4" drill, and right through the wood of the cab, so no new holes are going into your cab to affect the structural stability, you'll just drill through the rivet hole started at the Marshall factory. Then you'll use a pair of pliers to press in 10/32 T-nuts in the holes you just drilled the rivets out of from the inside of the cab. Since the old handle will be out, you don't have to take off your back panel at all, since there's a handle hole there already with plenty of room to work with. Channel locks or a hammer will also work to fit in the T-nuts. Then place the handle over your cab's new handle holes, and screw in the 10/32 machine screws with a drill or philips screwdriver. 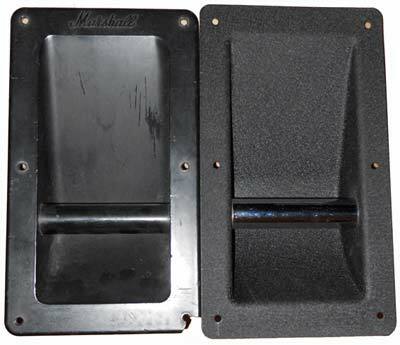 "The metal handles are sized correctly for installation into your Marshall 1960 cabinet. However, due to sloppy handle cut outs in the later cabs, clients have found you may need to use 80 grit sandpaper and sand out 1/16" or 1/8" on one or two sides to make them fit. This has only come up in the more recent 1960 AX/BX cabs in the last year or so." Shipping Fees - Shipping fees to the Continental U.S. is $16.00 per pair. *Screw Kit consists of 12 ea. 10/32 T-nuts paired with 12ea. 10/32 x 3/4" machine screws.